My husband and I are planning to head to BB for Memorial Day weekend. Initially I thought we would just try to get a Chisos Basin campsite that Friday morning. Now I am thinking we might like to do a backpacking trip instead. We can be at the park around 8 am on Friday and need to leave Monday morning, so we would have 3 nights as long as the last night was not too far from the trailhead. Where do we get the backcountry permit? Will we have trouble getting a permit for that weekend on Friday morning? Do you guys have any suggestions for a route/camp site preferences? Will water be available that time of year or do we need to carry enough for the whole trip? If so, we probably need to keep it at 2 nights (spend night 1 in Chisos Basin). We have hiked the South Rim as a day trip before so we are familiar with the terrain/difficulty. Thanks so much for the help. I assume you are talking about a Chisos trip and not a lower desert trip as it will most likely be too hot. Getting there when the visitor center opens on Friday will give you a better chance of sites in the Chisos. The SE and NE4&5 sites will still be closed for peregrine falcon nesting. Permits at either Panther Junction (opens at 9:00) or the Basin (8:30) visitor centers. Water in Boot canyon will be hard to call until closer but it is near the end of the dry season and so might be limited unless some rains come earlier. You can also check out the trip reports pages and see what other folks did around that time of years. Thanks! Yes, we are planning for the Chisos for this trip. We camped in the basin this past Labor Day weekend and I assume the temps will be higher for Memorial Day. I am not ready for camping in the desert that time of year. Thank you for the trip report link. They were great reads. I see we should expect the possibility of storms. We are hoping to use this trip as training/practice for a 4-5 night trip in Colorado this summer. I know the conditions are going to be different, but I really want to know how I tolerate multiple days on the trail (our current longest trip has been 2 nights). For that reason, I think I want to change sites each night to more closely mimic the setup/takedown process we will need for that adventure. Do you know about how long it takes to hike out from the Boot Canyon sites? We have an 8 hour drive home that last day and I want to get on the road early. 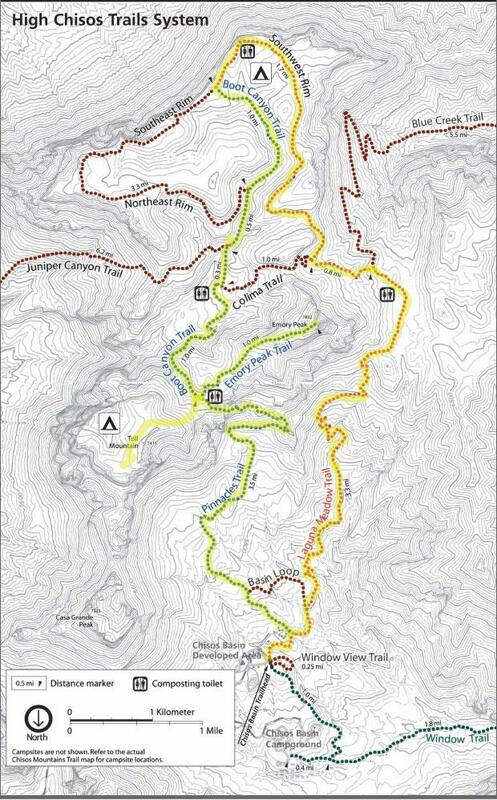 Are any of the sites along the Pinnacles trail closer to the trailhead nice? I don't see that the people writing the trip reports are staying in those. I want to make this difficult so I am thinking it makes sense to take Pinnacles up and down. 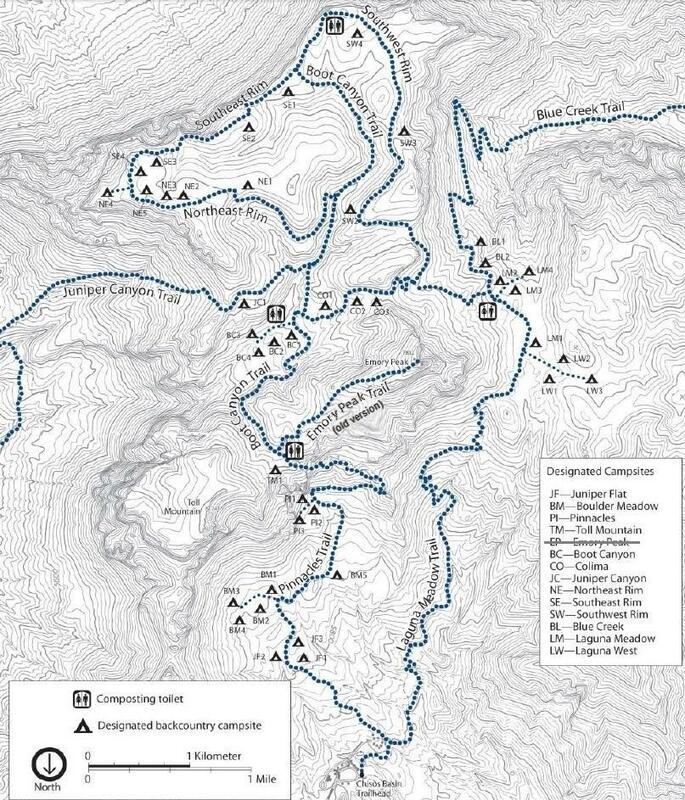 If there is not water at Boot Springs, I think we would stay day 1 in the Basin and then begin this itinerary on day 2. I don't think I can carry 3 days of water. Boot Canyon is about 4 miles or so from the Basin, so plan for about 2 hours to get down. If you want to make it difficult, then pack an ice chest and maybe a lawn chair or two. In the past decade I have generally found water either at Boot Spring or along the Boot Canyon trail to the south of the spring toward the end of May. Of course that's no guarantee for the future, and on occasion the standing pools have been rather unappetizing. Not many people ever stay below the Toll mountain campsite at all those others (Boulder meadow, Juniper flats, Pinnacles) because it is so close to the car, All those campsites get used when the upper Chisos campsites are full. When backpacking, it takes us 2 hours to walk up to the Toll mountain site/saddle. Then the Boot campsites are down hill for about 25 minutes. Walking out of the Chisos back to the car from Boot, it usually takes us a little less than 3 hours. We always seem to take just a little over 4 hours to walk back to the car from the rim. Colorado backpacking is easier than the desert. Unless you take on a bunch of elevation gains, and don't take the time to acclimate to the altitude. Water everywhere. In order to extend your trip, maybe look into staying at Laguna Meadows and day hiking from there down Cattail canyon. Pretty hard to get lost, and there almost always is water down there. Laguna Meadows, Boot Canyon, and a Rim site for a three nighter. Are any of the sites along the Pinnacles trail closer to the trailhead nice? I don't see that the people writing the trip reports are staying in those. I stayed at Pinnacles 1 on a trip I took at the end of April 2017. It was just as nice as any other Chisos Mountains campsite. It's only about 2½ miles from the Basin trailhead and about 800 feet lower in elevation than Pinnacles Pass. Compared to Labor Day, around Memorial Day temperatures are a couple of degrees warmer, so there's not much difference there, and it tends to be less rainy.